Dresdner is a classic old German style beer label design. The oval shape, the banner across the middle with the traditional blackletter-style font for your main text, plus the embellishment of shield with diamonds and stylized fir tree, brings to life the old German beer traditions. Colors are combinations from a thirties and forties color palette, increasing the richness and history of Dresden style. The accompanying neck label and text label for the back have complementary styling, to give your beverage the full visual effect. 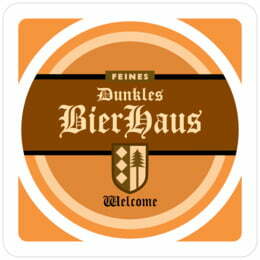 Customize your Dresdner coasters today! 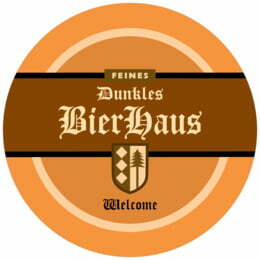 Dresdner coasters are made of extra-thick 58-point board. To give you an idea of how thick they are, a stack of a dozen coasters is about 3/4" tall. They are made of absorbent pulpboard to help protect your tabletop. The coaster surface has a smooth matte coating to provide beautiful, crisp printing. Each coaster is carefully die-cut in a letterpress, which gives the top edge its distinctive rounded shoulder. We use a digital 4-color, high-resolution press for fine detail and rich color. All of our personalized coasters are designed to match our labels, tags, and other products, so when you order multiple items, you get a matched set. On the back of each coaster, a small Evermine logo is debossed (pressed into the paper).